HARTFORD, Ohio (July 9, 2016) - “Downtown” Danny Holtgraver scored the largest Arctic Cat All Star Circuit of Champions victory of his career on Saturday night at Sharon Speedway, claiming the eighth annual Lou Blaney Memorial worth $10,000. 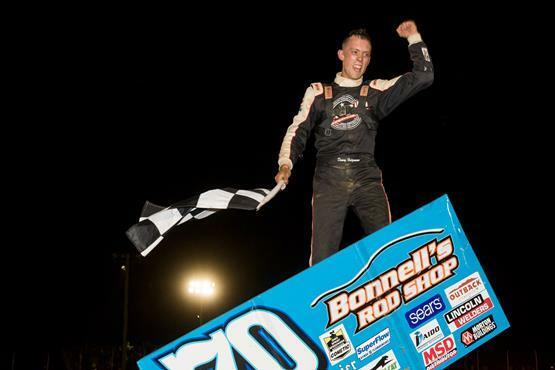 The Pittsburgh, Pennsylvania, native led all 30 circuits at the Hartford, Ohio, oval, surviving a last restart bobble to eventually hold back fourth row starter Sheldon Haudenschild and Ohio veteran Dean Jacobs at the final checkers. Holtgraver now owns two Arctic Cat All Star wins in 2016, raising his career win total to 11. Danny Holtgraver started second on the main event grid, jumping to an early advantage over Josh Baughman and Caleb Griffith. After two cautions on lap two, one of which involving Josh Baughman with nose wing damage, green flag competition resumed with Holtgraver holding the point. The pilot of Pete Grove’s Premier Motorsports/No. 70 reached the tail of the field by lap five, navigating safely on the topside of the speedway before approaching even heavier traffic by lap ten. In the meantime, Dean Jacobs, who started fifth on the feature grid, worked his way into second on lap four, setting chase on Holtgraver’s Premier Motorsports entry. Despite the traffic, Jacobs never lost sight of the leader, keeping Holtgraver within a few car lengths until caution lights reappeared on lap 19. Competition resumed with Holtgraver maintaining his position at the front of the field, flanked by Dean Jacobs and now Sheldon Haudenschild. Six more laps would be completed with the same running order, only to be stopped by caution lights on lap 25, setting up a clear track and clean air once again for Danny Holtgraver. Not without a restart hiccup, nearly making contact with the front stretch wall, Holtgraver brought the field back to green for the final time of the night. Sheldon Haudenschild made a surge to second on lap 25, driving by Dean Jacobs who started to feel the effects of a damaged nose wing. Even after the stumble, clean air and a clear track proved to be an advantage for Holtgraver, driving on to secure $10,000 by nearly two seconds. It was his first ever Lou Blaney Memorial title and his first ever Arctic Cat All Star victory at Sharon Speedway. The Arctic Cat All Star Circuit of Champions will continue their 2016 campaign with an appearance at the Eldora Speedway in Rossburg, Ohio. “America’s Series” will join the World of Outlaws Craftsman Sprint Car Series during their appearance at the World’s Greatest Dirt Track, taking part in the 33rd annual Kings Royal. The Arctic Cat All Star Circuit of Champions will officially join the Kings Royal agenda during the $50,000-to-win finale on Saturday night, July 16. The appearance will be worth show up points only. Shane Stewart is the defending event winner, scoring the $50,000 top prize over Jason Johnson and Rico Abreu a year ago. Those seeking additional information regarding the 33rd annual Kings Royal at Eldora Speedway should visit the “Big E” online at www.eldoraspeedway.com. 81-Lee Jacobs ; 2. 8M-TJ Michael ; 3. 57X-Andrew Palker ; 4. 21-Cap Henry ; 5. 22-Brandon Spithaler ; 6. 2-AJ Flick ; 7. 5K-Adam Kekich ; 8. 13-Brandon Matus ; 9. 49H-Bradley Howard ; 10. 60-Kory Crabtree ; 11. 23M-Lance Moss ; 12. 57-Gary Edwards ; 13. 24-Alex Paden ; 14. 4W-Eric Williams ; 15. 4C-Paul Kish ; 16. 12X-Michael Flynn ; 17. 33-Brent Matus ; 18. 23-Darren Pifer ; 19. 1R-Gale Ruth Jr.